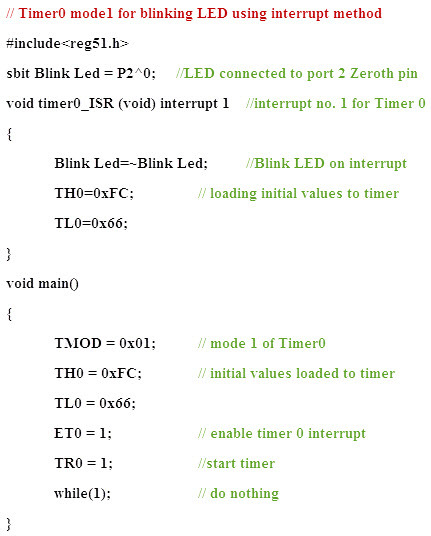 The most powerful and important features are interrupts in 8051 microcontroller. In most of the real-time processes, to handle certain conditions properly, the actual task must be halt for some time – it takes required action – and then must return to the main task. For executing such type of programs, interrupts are necessary. It entirely differs from the polling method wherein the processor must check sequentially each device and ask whether the service is required or not while consuming more processor time. 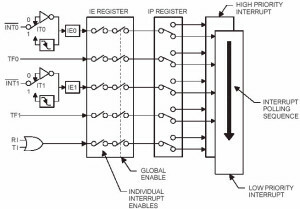 Interrupts in 8051 microcontroller are more desirable to reduce the regular status checking of the interfaced devices or inbuilt devices. Interrupt is an event that temporarily suspends the main program, passes the control to a special code section, executes the event-related function and resumes the main program flow where it had left off. Interrupts are of different types like software and hardware, maskable and non-maskable, fixed and vector interrupts, and so on. Interrupt Service Routine (ISR) comes into the picture when interrupt occurs, and then tells the processor to take appropriate action for the interrupt, and after ISR execution, the controller jumps into the main program. 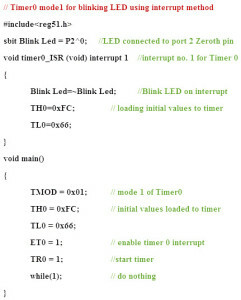 The Timer and Serial interrupts are internally generated by the microcontroller, whereas the external interrupts are generated by additional interfacing devices or switches that are externally connected to the microcontroller. These external interrupts can be edge triggered or level triggered. When an interrupt occurs, the microcontroller executes the interrupt service routine so that memory location corresponds to the interrupt that enables it. 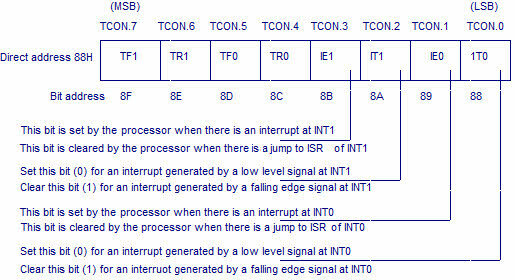 The Interrupt corresponding to the memory location is given in the interrupt vector table below. Upon ‘RESET’ all the interrupts get disabled, and therefore, all these interrupts must be enabled by a software. 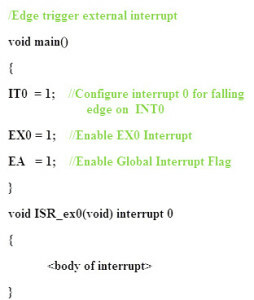 In all these five interrupts, if anyone or all are activated, this sets the corresponding interrupt flags as shown in the figure. 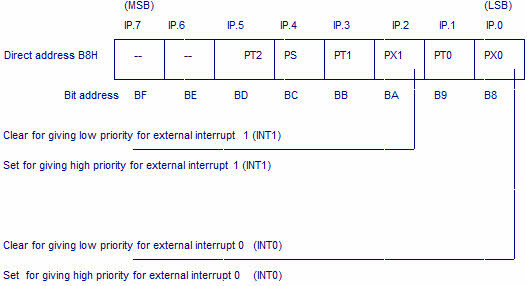 All these interrupts can be set or cleared by bit in some special function register that is Interrupt Enabled (IE), and this in turn depends on the priority, which is executed by IP interrupt priority register. Interrupt Enable (IE) Register: This register is responsible for enabling and disabling the interrupt. It is a bit addressable register in which EA must be set to one for enabling interrupts. 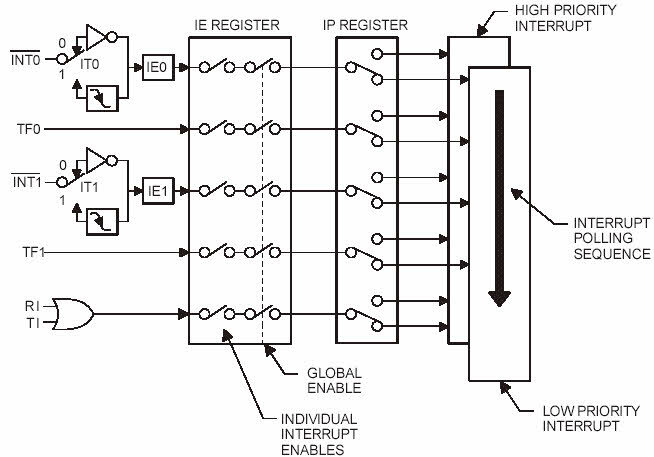 The corresponding bit in this register enables particular interrupt like timer, external and serial inputs. 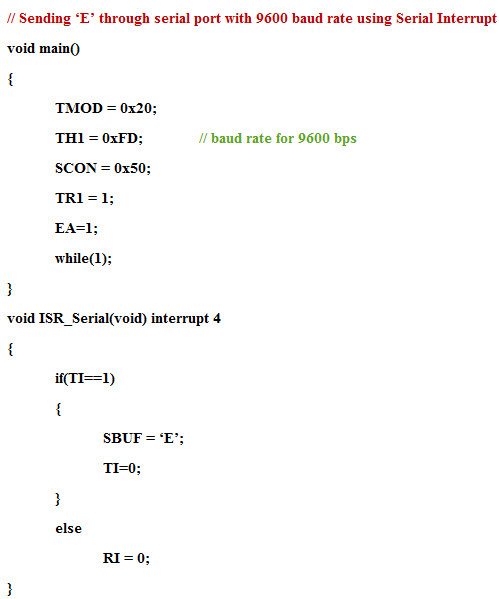 In the below IE register, bit corresponding to 1 activates the interrupt and 0 disables the interrupt. 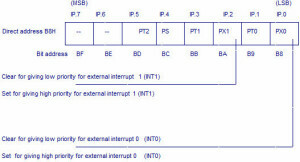 Interrupt Priority Register (IP): It is also possible to change the priority levels of the interrupts by setting or clearing the corresponding bit in the Interrupt priority (IP) register as shown in the figure. This allows the low priority interrupt to interrupt the high-priority interrupt, but prohibits the interruption by another low-priority interrupt. Similarly, the high-priority interrupt cannot be interrupted. If these interrupt priorities are not programmed, the microcontroller executes in predefined manner and its order is INT0, TF0, INT1, TF1, and SI. 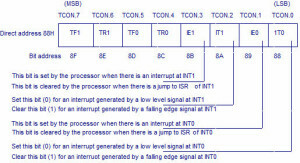 TCON Register: In addition to the above two registers, the TCON register specifies the type of external interrupt to the 8051 microcontroller, as shown in the figure. The two external interrupts, whether edge or level triggered, specify by this register by a set, or cleared by appropriate bits in it. And, it is also a bit addressable register. Selecting the timer by configuring TMOD register and its mode of operation. Choosing and loading the initial values of TLx and THx for appropriate modes. Enabling the IE registers and corresponding timer bit in it. Setting the timer run bit to start the timer. Writing the subroutine for the timer for time required and clear timer value TRx at the end of subroutine. 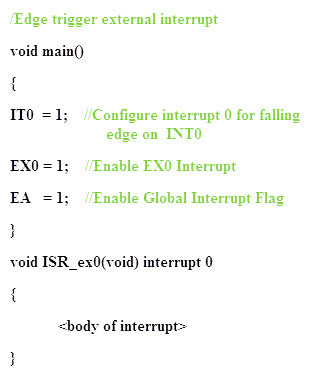 Enable the corresponding bit of external interrupt in IE register. If it is level triggering, just write the subroutine appropriate to this interrupt, or else enable the TCON register bit corresponding to the edge triggered interrupt – whether it is INT0 or INT1. Serial communication interrupts come into picture when there is a need to send or receive data. Since one interrupt bit is set for both TI (Transfer Interrupt) and RI (Receiver Interrupt) flags, Interrupt Service routine must examine these flags to know the actual interrupt. The logical OR operation of these two flags (RI ands TI) causes this interrupt, and it is cleared by the software alone. Here, a special register SCON is used for controlling communication operation by enabling the corresponding bits in it. Write subroutine for this interrupt with appropriate function and clear TI or RI flags with in this routine. 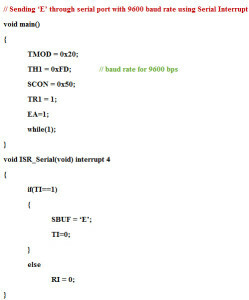 This is all about interrupts in 8051 microcontroller, types, their structure and programming. Hope you might have received good information from this article. Also, you can write to us in the below comment section for the real-time implementation of microcontroller projects so that we can assist you for a better hands-on experience. Sir I m in EE 5th Sam I want to learn the question what are the special registers..
Special Function Registers (SFRs) are a sort of control table used for running and monitoring the operation of the microcontroller. Each of these registers, as well as each bit they include, has its name, address in the scope of RAM and precisely defined purpose such as timer control, interrupt control, serial communication control etc. Even though there are 128 memory locations intended to be occupied by them, the basic core, shared by all types of 8051 microcontrollers, has only 21 such registers. Rest of locations are intensionally left unoccupied in order to enable the manufacturers to further develop microcontrollers keeping them compatible with the previous versions. 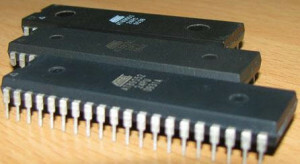 It also enables programs written a long time ago for microcontrollers which are out of production now to be used today. I am searching for program of interrupt driven for pulse width measurement using c programming for 8051. I have done it using polling method. can you help me for interrupt driven using vector location? Thanks very much for the kind gesture,this site has greatly helped me to do most of my academic work. I am a EEE 2nd yr student.sir i want to do some low prise mini electronics project. So, plz help me sir.